Large summits are nothing new. The 36th G8 summit will set up shop in Huntsville June 25-26. Toronto, a past host, will this time welcome the 4th G20 summit June 26-27. The following is the third in a six-part series of briefs looking back on past G7/G8 summits and protest. Check back each Sunday for a blast from the past when we recap a different summit's official agenda and civilian and activist responses. The Genoa summit has become infamous for the shooting death of protester Carlo Guliani. His was not the only blood shed at the hands of Genoa police during the 2001 G8 meetings. The summit's focus was global poverty reduction, but its content was overshadowed by waves of repression and resistance between police and protesters. Over three days, more than 300,000 people protested the G8 in Genoa. At times, protesters seemed to have the upper hand; forcing police to retreat, even chasing them down the street. At other moments, brutality and violence by the carabinieri, Italy's police force, set the tone of the summit, as shown in video footage of groups of police beating a protester caught alone on the street. In a show of force rarely seen in North America, Italian industrial labour unions put their skills to work building protest infrastructure to shield them from police attack. With large sturdy shields, they marched in old military formations through the streets of Genoa. And in response to requests by Italian Prime Minister Silvio Berlusconi to not dry their laundry outdoors, people hung clotheslines full of their underwear out their windows as protesters marched through the streets. On Friday, July 20, Carlo Guliani, a 23-year-old Italian protester, had dropped a fire extinguisher and was holding his hands up in the air when he was shot twice by police and then run over by a police vehicle. The crowds in the streets swelled as news of his brutal killing spread, with marchers chanting, " Assasino !" An anarchist flag was draped over his coffin at his funeral. The next night, 340 police officers raided the School of Diaz, thought to be a safe place for protesters, mostly students, to sleep. Scores of police forced their way into the building and began beating those inside. Video footage from after the attacks shows blood smeared across the floor and splattered against the walls. It was reported that protesters were urinated on and forced to sing fascist hymns. One protester described it as "complete carnage. There was blood everywhere...we were tortured, and I don't use that term lightly." 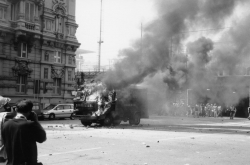 In all, 61 people were badly injured and 93 were arrested, using what the Genoa Justice Campaign, an organization seeking investigations into police brutality at the Genoa Summit, labels “counterfeited evidence.” Charges against all 93 were dropped, and in later testimony the Deputy Police Chief of Genoa admitted to having planted Molotov cocktails and staging the stabbing of a police officer. Approximately 300 protesters were arrested and over 230 were injured in Genoa. In the weeks following the summit, dozens of police officers and state officials were charged with physically and mentally abusing protesters, planting evidence and wrongful arrest. Since then, 26 police officers, prison staff and state officials have been found guilty of abuse and negligence, but no senior level police officials have been held accountable. Genoa will be remembered as a monstrous display of state repression of dissent. It will also be remembered for the incredible defiance and strength shown by protesters in their perseverance in challenging the police and the state. After Genoa, it seemed something was shifting: resistance to the G8 and the international structures it supported was gaining strength. And then September 11th happened, and suddenly, everything was different.